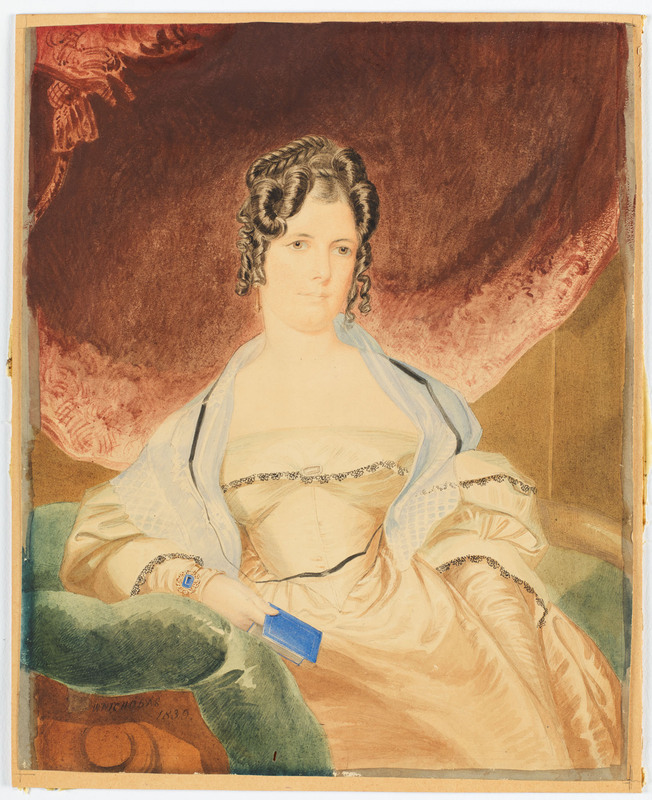 This front facing, ¾ length portrait shows Mrs Hannah Tompson (aged 36) seated in a drawing room setting. She is posed with her right arm resting on a large turquoise blue [velvet] cushion, placed over the out swept arm of a sofa with matching upholstery, a dark red curtain draped across the brownish-green painted wall behind. She holds a small blue book in her right hand and the black ribbon round her neck may suspend a pair of ‘pince-nez’ style reading glasses. Mrs Tompson wears an evening [dinner] gown made of a plain, cream-coloured [silk] satin or taffeta, cut very low off the shoulders to reveal her décolletage. The turn back collar of the neckline, trimmed with a narrow [black] lace edging, extends the fashionably wide silhouette out over large ‘bouffant’ (puffed) ‘gigot’ (leg of mutton) sleeves, set low on the shoulder, trimmed above and below the elbow with a pair of lace-edged ‘mancherons’, or flat oversleeves. Following the dramatic deflating of the sleeve head in mid-1836, the fullness of the sleeves has slipped down below the shoulder to the middle of the upper arm, fitting tightly along the forearm and tapering to the wrist. The form-fitting bodice is set above a full skirt eased into the deeply-pointed waistline with a series of pleats over the hips. Her dark glossy hair is parted slightly to the left of centre, horizontally-arranged into large ‘sausage’ curls on each side at the front, with ringlets hanging over her ears below, and braided into a bun set high on the crown at the back of her head which is uncovered. A sheer white ‘fichu’, or kerchief is draped over her shoulders and she wears a range of jewellery comprising a pair of pendant gold earrings, a small rectangular brooch pinned to the corsage of her bodice and a gold bracelet set with a blue stone, probably one of a matching pair, worn over the base of her sleeve at the wrist. NB: During the early 19th century, dinner was served at 5 or 6 o’clock, and considered an afternoon rather than an evening function. A dinner dress was a semi-evening costume often worn with an evening headdress. Evening gowns are typically cut low to show off the décolletage and dinner gowns were typically made with long-sleeves, while ball gowns were short-sleeved. Miss Hannah Morris (1803-1874) was born in Sydney. She married public servant and poet Charles Tompson Jnr (1807-1883), at St Matthew’s, Windsor, on 12 April 1830. Charles Tompson Jnr was born in Sydney, the eldest child of emancipist farmer Charles Tompson (1784?-1871) and his wife, Elizabeth (née Boggis), and is claimed to have been the first published Australian-born poet. By 1831, the couple were living in Kent Street, Sydney, where Tompson had become a clerk in the colonial secretary’s office. He remained until 1836 and, from this time, seems to have eschewed writing poetry, concentrating instead on his career as a public servant. William Nicholas (1807-1854), watercolourist, etcher and lithographer, was best known as a portraitist. He was in demand soon after his arrival at Sydney in the ‘Roslyn Castle’ on 25 February 1836. Surviving portraits prove he quickly attracted the colony’s social and professional élite. By November 1840 Nicholas was reported as ‘conducting Mr Barlow’s business’ and January 1842, he set up on a grander scale, advertising as a ‘miniature painter on ivory and in watercolours, lithographer and draughtsman’. He provided an attiring room for ladies to change into their best clothes at his studio-residence, 6 Elizabeth Street South, and charged from 1 to 3 guineas for his portrait miniatures. Taking an active part in Sydney’s early art exhibitions, Nicholas died in Sydney, aged 48, on 23 June 1854.